Surprisingly enough, there are quite a few pine trees around where I live - which seems weird in Arizona - and they drop the most beautiful pine cones… perfectly shaped! They were just way too perfect not to gather and use (despite how ridiculous I’m sure I looked walking around with a plastic grocery bag full of pine cones). I feel like I wouldn’t have looked as homeless gleaning for pine cones if I had a paper bag, but I only had plastic… gotta work with what you can! I was even thinking about just throwing them in my purse, but that may have been even stranger – can you tell I spent some time strategizing? Once you gather your pine cones, bake them for 40 minutes in a 250 degree oven. This is to kill all of the little bugs that may be hiding in them. After you bake them, wash them to remove all the dirt… Since I am OCD and don’t like bugs, I baked them a second time for 40 minutes in a 250 degree oven just to be sure. After your pine cones have cooled, take your twine and tie a knot around the whole pine cone as high up on the pine cone as you can. 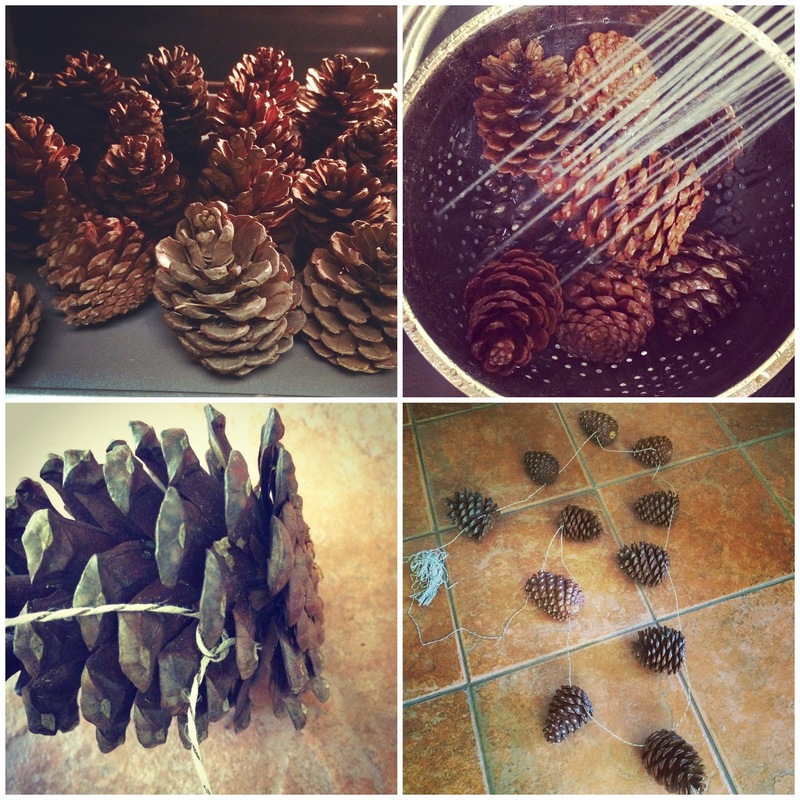 Continue to tie additional pine cones until your garland is the desired length. Although this may not be the prettiest way, it was definitely the easiest… I originally tried to anchor the string to the top of the pine cone via a nail in the top of the pine cone, but the pine cones were so solid that my nails were bending and not going in! 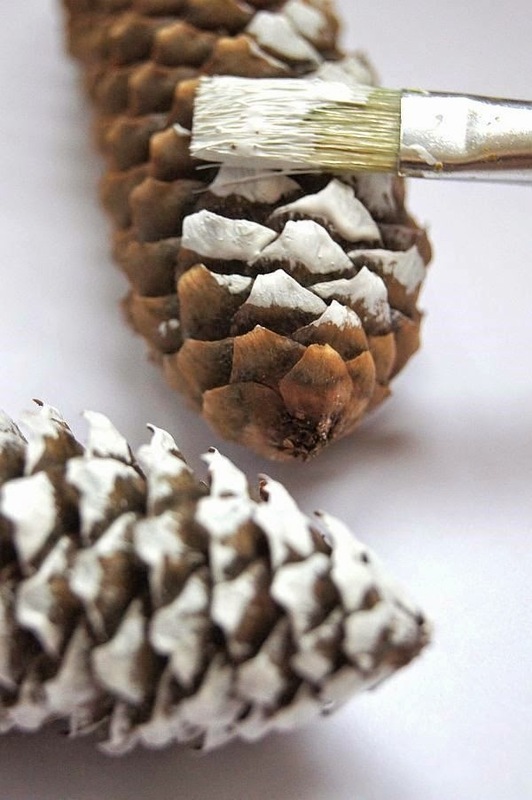 If you’re feeling extra crafty, you can roll the tips of your pine cones in white paint to get a really cool “snow” effect. Since where I live in Arizona doesn’t get snow, I opted against this. I gathered about 25 pine cones and used about 15… if you can find a ton of pine cones, there are some super cool things you can do with them. Here is some inspiration that I was loving from Pinterest. Turned out so cute! Love your mantle with the mercury glass accents! I reallly love that wreath in the last picture! Wow! Can't wait to give this a try! We have a tree in our backyard that drops the perfect pine cones so thankfully I won't have to go too far to get them :) I'm just so excited to finally have a mantle to decorate! Such a great DIY - I really love them in the center of the table - easy centerpiece! 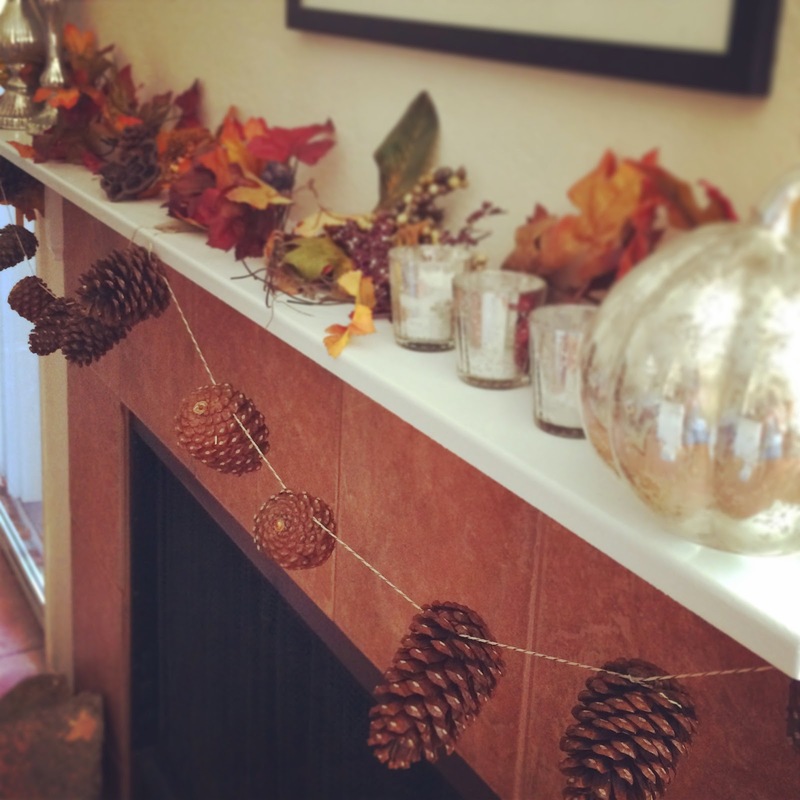 Love this, and your fall mantel! I so would not expect for you to be able to find those beautiful huge pine cones in Arizona! They are huge compared to what I've seen around here! Love the way it turned out, your mantle is very cute! Loving that wreath you shared too! Such a cute idea for a garland! Love your decor! I love this so, so much and will definitely be adding to my crafting to-do list! 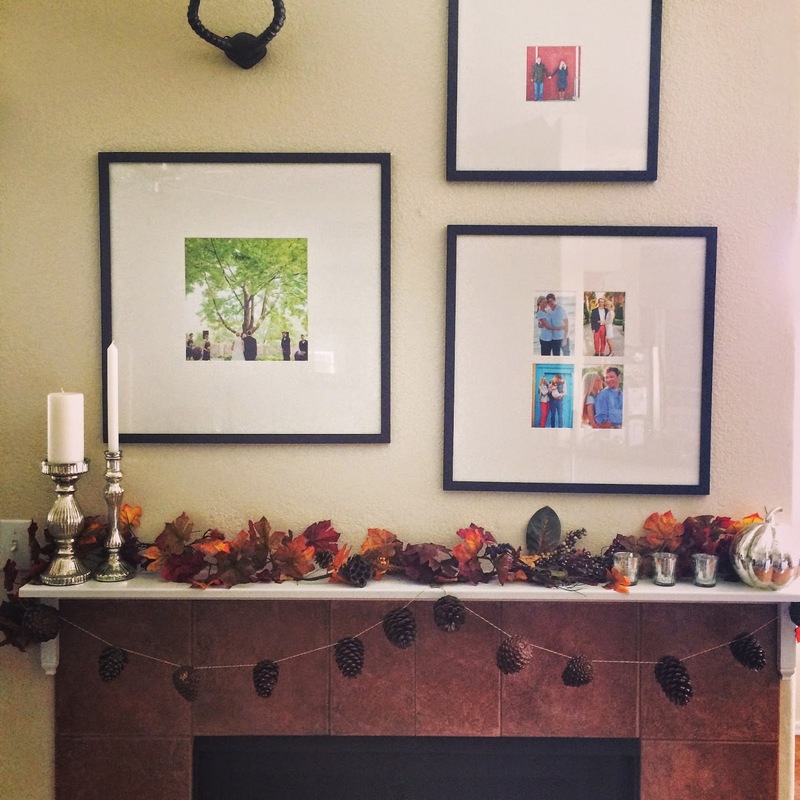 I have a mantle that is just screaming for a little autumnal goodness, so this is perfect! Thanks for sharing! Cute! I had no idea about baking your pine cones. We have a ton of pine cones waiting to be crafted or set out for decoration. Some are store bought, but we used to have a big pine tree too. The store bought ones smell cinnamon and pine-y. Wonder if you could do that to the natural ones somehow in the oven? I'm going to have to use some of mine for this project! Love this idea! It's perfect for fall. Also, I was on the phone at work when I read the part about putting them in your purse and I seriously laughed out loud at the poor girl. Whoops! The image of you going around gathering pine cones and sticking them in your purse definitely put a smile on my face! Love your garland! Love it! I am in an abundance of pine cones... all shapes and sizes. There might be a new project in my future. Suuuuuper cute! I think my dog would be too intrigued by it! hahaha ... after your pine cones have cooled.. ever think you'd be typing that sentence? Good thing to know though, I wouldn't have thought about baking them for bugs if I had just winged it. I love the white paint for snow, that would be a cute Christmas thing. Although I don't think we even have pinecones...not sure. I never would have thought of this but it is the best idea ever. I really want this for my house now. I'm a pinecone junkie: I live in the Piney Woods of East Texas! Love them and it's so nice to decorate with natural elements. Love your garland. SO SO SO cute! We are not in a place to decorate right now, but I am tucking this tidbit away for next year! Thanks for linking up with WYWW! Oh my gosh, this is so cute!! 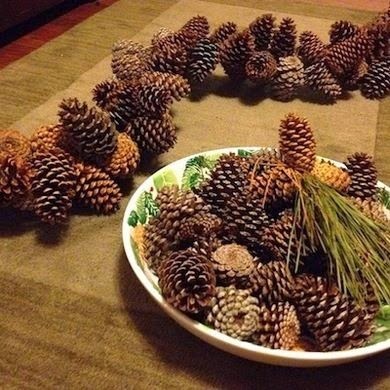 I would totally spray paint the pinecones with some gold glitter or something! yay!! I was hiking yesterday and remember your post! I wanted to start picking up all of the pinecones but I only had a little sweatshirt pocket and knew that I wasn't going to want to carrying around 50 pinecones on my hike, haha! Can't wait to try this though. Yours is so cute! 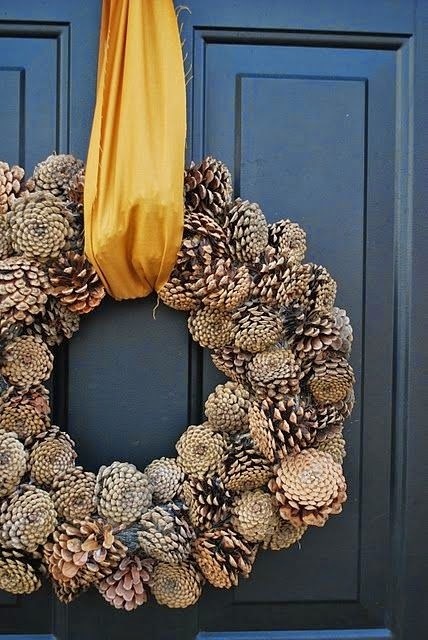 I already loved the idea of decorating with pine cones, but turning them into a garland? So cool! This is absolutely gorgeous and brilliant! I love pine cones!